Stocks were off slightly Monday morning as investors awaited quarterly results from an onslaught of major corporations across sectors, with consensus estimates pointing to a broad-based decline in earnings over last year. U.S. stocks tilt lower Monday, as investors return from a long Easter weekend to face a heavy earnings calender and important data. The S&P 500 logged slight losses for the holiday-shortened week, however the benchmark was about 1% away from a record high hit in September, boosted in part by largely positive earnings. About a third of the S&P 500 companies, including Boeing Co, Amazon.com Inc and Facebook Inc, will report this week, determining whether investors should be concerned about the start of an earnings recession or whether back-to-back quarters of negative growth can be avoided. S&P 500 profits are expected to drop 1.7% year-over-year, according to Refinitiv data, in what could be the first earnings contraction since 2016. The Dow Jones industrials lagged the major stock indexes early Monday. Boeing stock was one of the worst performers on the Dow 30. U.S. stocks edged lower at the open on Monday, weighed down by technology shares, as investors took a cautious stance at the start of what is expected to be the busiest week of the first-quarter earnings season. The Nasdaq Composite dropped 28.69 points, or 0.36%, to 7,969.37 at the opening bell. Shares of Fastenal, Intuitive Surgical, and Lam Research were getting attention, while the Dow was poised to open lower. Eighty companies in the S&P 500 have reported so far. First-quarter earnings growth has decelerated to just 0.5% versus last year’s first quarter. Global stocks drift lower as major markets remain closed for Easter observances. Oil prices test six month highs amid reports that U.S. waivers on the purchase of Iranian crude will be lifted next week. 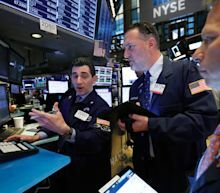 Global stocks drifted lower Monday, as major markets in Europe and Asia remained closed for Easter celebrations, while oil prices tested six months highs amid reports that the U.S. will end waivers for the purchase of Iranian crude next week. BEIJING (AP) — World stock markets were mostly lower while oil prices surged for a second day Monday following reports Washington wants to block Iranian exports. A gauge of global stocks fell on Thursday after underwhelming manufacturing surveys from Asia and Europe, though it pared losses as Wall Street edged higher on strong U.S. retail sales data and earnings from industrial companies. The U.S. benchmark S&P 500 index inched forward on strong March retail sales data, which registered their greatest increase in 1-1/2 years, and upbeat results from Union Pacific Corp and Honeywell International Inc.